Automatic Transmission without Reverse, GY-6 Engine, Air Cooled, Differential Gears, Front /Rear Disc Brakes, Aluminum Wheels, Trunk Included, Tow-Hitch Included, Metallic Paint, Mid Size, U.S. Patented Trike. This model is not for sale in CA. The ICE BEAR 150cc MOJO Motor Trike 3-Wheel Moped Scooter (PST150-9) is built with sporty body design. 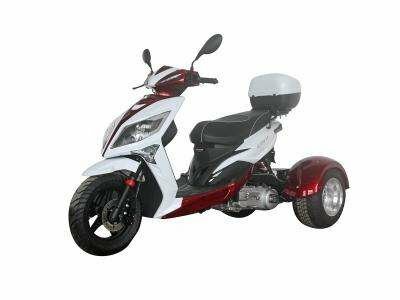 Its net weight is lighter than most other 150cc trikes and the speed is faster. 100% street legal in 49 States except for California, It will be registered as a motorcycle or scooter depending on the state you live in. 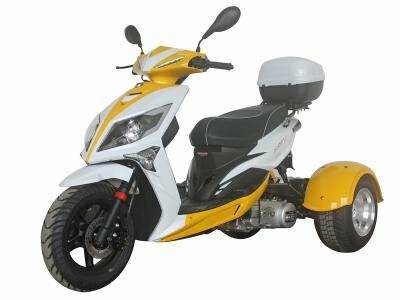 With top speed of 55 mph, this machine runs very well and is perfect to get around or to use as a transportation with more safety features than a 2-wheel scooter or motorcycle. 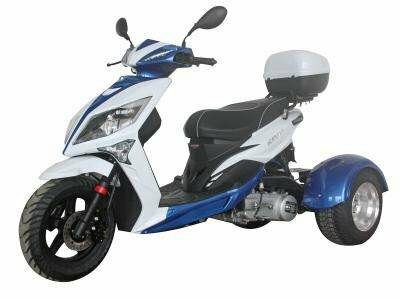 Popular body design, Equipped with GY6 air cooled engine, Chain driven, Dual disc brakes, Big & bright dual headlights, Big turn lights, Stylish muffler, Extra large rear trunk. Fully Automatic transmission, 12" front wheel and 10" extra wide rear wheels. At 70~90 MPG and the gas prices are climbing, this motor trike is a smart choice for everyone! 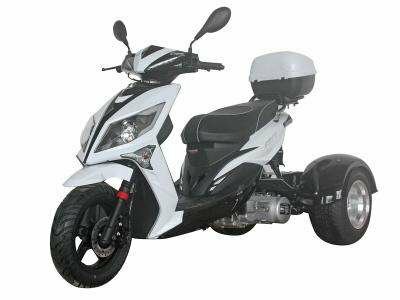 Be the first one to get this high quality 3-wheel beauty at unbeatable price and services, you will be the talk of the block! Available Black/White, Yellow/White, Burgundy/White, Blue/White.